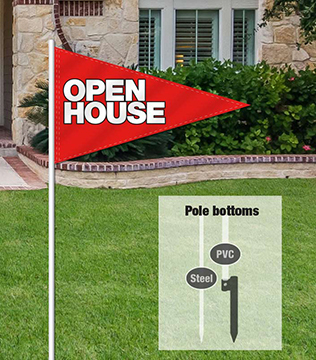 Flags available on Full Metal and PVC Poles. If using only with PVC A-Frames, order the 1/2 PVC Pole. For more value, order the Full PVC Pole which can be split for use with PVC A-Frames. PVC (67") Pole $3.00 ea. Metal (70") Pole $3.00 ea.